Movies of power, depth and talent are few and far between. American History X is one such film. It is the story of a family is distress. The oldest son is a neo-Nazi skinhead (Edward Norton) . A natural leader that is used by a white supremacist to further his cause of hate and violence. The younger brother and narrator is played by Edward Furlong. The older brother goes to jail for the murder of a black man. During his imprisonment, his brother embraces the cause of his older brother and idol. 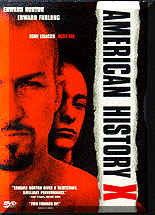 The young brother is forced to write a paper for the school principal called American History X, a chronical of his relationship to the older brother. The film is woven with flashbacks (in black and white) and current events that have shaped the younger brother into a person of hate and rage. During his time in prison the older brother changes. He see the hypocrisy in his fellow skin heads and forms a close friendship with a black man that works with him in the prison laundry. Once released he tries to heal the riff his old self caused with his family and to steer his younger brother away from the mistakes he made. The film is a series of masterful scenes, each one connected to the others to tell a story of depth and humanity, of change and process. The acting is top notch. Edward Norton commands the screen in every one of his scenes. His talent is up there among the best not only of today's actors but he rivals the abilities of even the golden age of Hollywood. It must be difficult for an actor to take on a part with such an incredible personal arc of growth as this role demands. His character has to go from an unswerving neo-Nazi to a sympathetic, emotionally strong individual. Norton approaches this role with a depth that memerizes the audience. Furlong, as the younger brother is far better an actor than his famous role in Terminator 2 would have you believe. In this film he also exhibits a grown, potential and talent that will make him an actor to watch. The supporting characters are real and believable with Beverly D'Angelo and Fairuza Balk adding moments of grit that often hits you like a visceral punch. The direction is wonderful although director Tony Kaye requested that his name be removed from the film over artistic differences. Still, the work holds as a real gem. Kayes's use of closeups is extremely creative. There are moments in the film that are studies of the human face and all the subtle emotions it can convey. With the clarity of DVD you can appreciate every line, pore and aspect of the expression. He sets the many flashbacks apart from the rest of the film by using black and white for those scenes. It gives a sharper clarity to them and heightens the impact. Kaye also is very straight foreword in his use of lighting, using shadows to frame the action. The DVD is of the finest quality. The sound is real and gives the impression you are there with the actors living the story. The picture is true and clear without any defect. The added features included deleted scenes that help you understand the process of making the movie. Some ads state that there is a director's commentary track but it appears to have been removed due to legal problems with the director. Get this one, it is bound to be a classic.